Although primarily a winter sports town, there is far more to do in Breckenridge than simply ski, snowboard or snowmobile. Although no excuse is needed for a visit to this spectacular mountain town, there are some popular events in Breckenridge that are sure to bring in great crowds each year. To join in on the fun and festivity, keep reading for more information on Breckenridge Events and activities. .. In January of each year, the town of Breckenridge is transformed as it becomes home to the International Snow Sculpture Championships. During this exciting time, talented ice sculptors from across the globe travel to Breckenridge to compete against each other to create impressive works of art from tons of snow. In 2013, the Snow Sculpture Championships will be held from the 22nd January to the 26th January, with sculptures open to public viewing from the 26th January to the 3rdFebruary , at the RiverwalkCenter. The Public is able to get involved in the competition, by voting for their favorite sculpture to win the People’s Choice Vote. 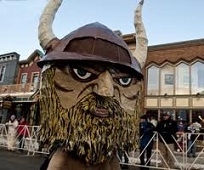 The Ullr wacky Winter Festival is taking place from January 6th to January 12th, 2013 in Breckenridge. The festival is a fun-filled homage to Ullr, the Norse God of Snow, and the city is transformed into a traditional Norse village. Skiers will be seen wearing Viking Hats, while fun events such as the Ullympics and the Ullr Float Parade make for non-stop festivity. The Genuine Jazz Festival has taken place every year in Breckenridge for more than 20 years, and continues to attract well known Jazz musicians from across the country and further afield. This year, the Genuine Jazz Festival is happening from the 24th of August to the 26th of August, at the Copper Mountain Resort. The line up includes such names as Paul Taylor, Ronnie Laws, Nick Colionne and Alex Bugnon. As well as giving residents and visitors access to some world-class Jazz music, the Genuine Jazz Festival also has a wine tasting component. Every Oktober, the German spirit of Oktober Fest travels thousands of miles across the Atlantic to Breckenridge for the annual Oktoberfest celebrations. This year, Oktoberfest is happening from the 14th to the 16th of September. Prepare yourself for a week long celebration including mind-numbing parties, German cuisine, and of course Germany’s favorite beverage, beer. On Saturday and Sunday night, the Breckenridge Main Street will explode in a colorful combination of traditional German clothing, Bavarian dancers, German cuisine and beer as well as plenty of child-friendly activities to keep the kids entertained. These are just a few of the exciting events that are available in the town of Breckenridge – certainly no sleepy hollow! Many of the local restaurants and accommodation providers in the town offer specials during the times of the festivals, so look around and you could find yourself a great deal! How To Live In Port Isabel? © 2013- 2019 Globerove. All Rights Reserved.